But federal budget cuts threaten the program. SKOWHEGAN — Jade Oliver says her grades have improved and she’s finishing more school work since coming to the Marti Stevens Learning Center in February. A 16-year-old freshman from Smithfield, Oliver is one of 10 students enrolled in a new sustainable agriculture program at the alternative high school in School Administrative District 54. “This program has helped me so much,” Oliver said, standing inside an old school bus that has found new life as a rabbit coop. 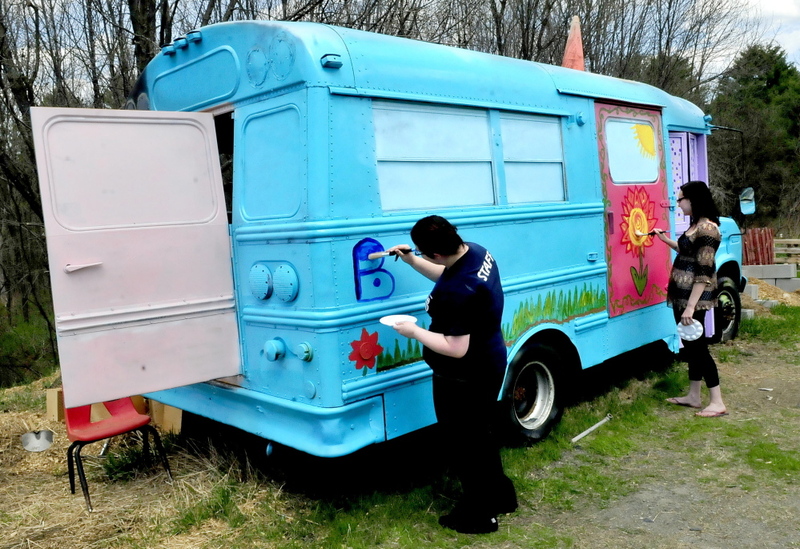 Sustainable agriculture program students Jade Oliver, left, and Savannah Witham decorate the “Bunny Bus” at the Marti Stevens Learning Center in Skowhegan. 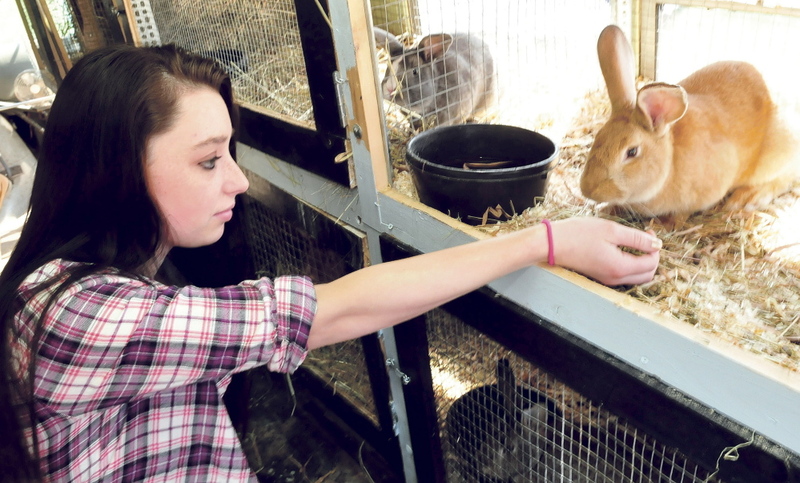 Danika Andrews feeds a rabbit in the “Bunny Bus.” Marti Stevens students converted two donated school buses to house animals, and hope to add chickens, goats, sheep and ducks to their program. The coop is one of many projects the students have taken on since the program launched in November. Students helped design the program’s project-based learning curriculum. All the participants in the program had dropped out of high school at some point or were considered at risk for doing so. But since the program started, administrators say they have seen fewer behavioral problems and higher attendance rates. 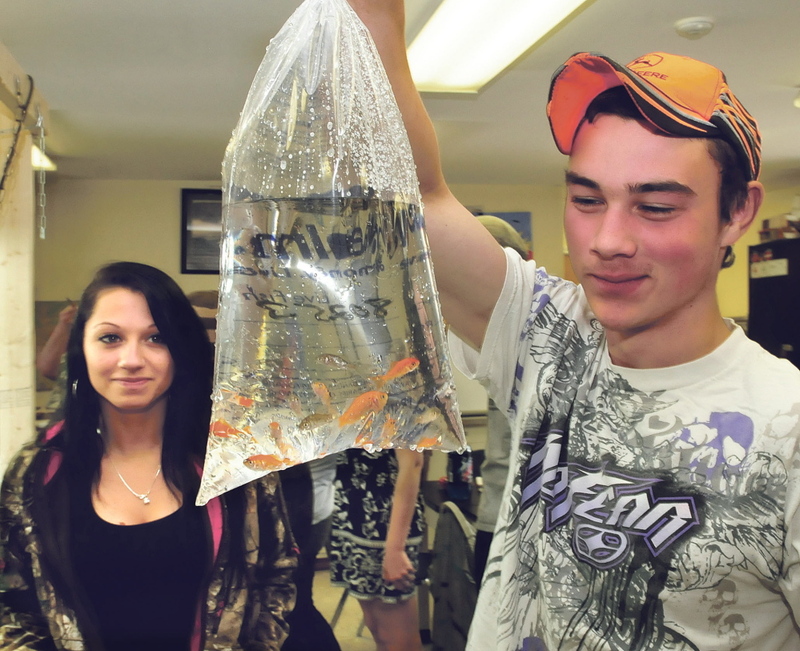 They’d like to see the program grow, with its curriculum based around aquaponics and livestock management. But starting next year, the AmeriCorps grant that has made the program possible will no longer be available. And as the school district budget season approaches, administrators are worried about district funding for the Marti Stevens center itself. Two staff positions have already been eliminated for next year. The nonprofit group helps place AmeriCorps members, volunteers who work for a small stipend, in schools and organizations. The Marti Stevens sustainable agriculture program started with the help of Angela Dunton, an AmeriCorps member whom Goodwill helped place. Dunton grew up in nearby Pittsfield and attended the University of Maine. After she graduated, she took her first teaching job in the remote and largely Native American village of Emmonak, Alaska, teaching social studies to high school students there. She eventually returned to Maine and to a job at Marti Stevens. Here, she’s donated her own rabbits and goats to the program, voluntarily driving the goats – Daisy Lou and Skippy John Jones – to and from school each day until it was warm enough outside for the students to build them a pen. On a recent school day, students had just finished building the aquaponics system, which consists of animal feed tanks connected with PBC piping. They’d gathered around the tanks to release bags holding some 105 goldfish into the system. Because goldfish are inexpensive and can survive wide differences in temperatures, they were chosen as a “sacrifice fish” while the students learn to monitor pH levels in the water. Eventually, they will add fish that can be consumed for food, with the fish waste being absorbed as nutrients for plants – like the Swiss chard the students are growing in the aquaponics system. The aquaponics, like the other projects on campus, are incorporated into every lesson; the students’ written work and homework are directly related to the projects they are working on. The Marti Stevens Learning Center, located across the street from the district’s high school campus and administrative offices, started in downtown Skowhegan as the Cross Roads Learning Center, a school and home for teenage mothers. It was founded by Marti Stevens, a New York City actress who came to Maine to start a teaching career. Just six days after she moved here she was injured in a serious car accident. She began teaching from her home, founding a tutoring program to help high school dropouts earn a degree. She later started the Cross Roads program, which was incorporated into the school district in 1987. Two years later, the Cross Roads school began enrolling male students, and Barry Sites was hired to be the school’s first male teacher; he’s now the principal. When Stevens died in 1993, the school was renamed in her honor. Today, it enrolls 53 students and is divided between the “project side of the house” and the old-style alternative education program, where students get remedial help. “That (traditional) approach worked for a lot of kids for a lot of years, but now we’re hoping this (new) program will work for a lot more,” Sites said, as he stood in a school corridor that divides the new program and the old. On the project side, students are eager to show off their work – the refurbished bus that serves as a rabbit hutch, another bus that they are turning into a home for goats, the new pen for goats and two compost piles. The “bunny bus” is a brightly colored school bus painted with the words “Hop On!” Inside, the benches have been removed, and shelves with cages line the walls. Four rabbits call the place home. The students intend to auction them at the end of the school year in order to raise money for new projects. One goal in the coming year is to expand the livestock program to include five heritage breed animals: the American chinchilla rabbit, Sultan chickens, San Clemente goats, Clun Forest sheep and Welsh Harlequin ducks. While the two buses don’t have working engines, students and teachers hope to find some that do. They want to make the center a resource for the district and the public, and they want to open it for summer programs, keeping the agriculture program going year-round. Now that the goat pen is finished, students are dreaming of re-establishing a duck pond in the back of the campus, building an arboretum and incorporating solar and wind power into their curriculum. By its very definition, farming looks forward: What crops to grow next year? What animals to raise? What systems and infrastructure are necessary to make those happen? But even as the students think ahead, the future of the project and others like it in New England could be threatened next year because of changes in federal funding for the Great Strides Rural Education Corps, the program that brought Dunton to the community. Great Strides is funded by AmeriCorps. The funding shortfall comes from both an increase in demands on the AmeriCorps program (many more organizations are requesting volunteers), and from federal budget cuts, known also as sequestration. Great Strides prefers to have ongoing partnerships, according to Christian, so a school like Marti Stevens could normally expect to get a new AmeriCorps volunteer when Dunton’s year is over. The loss of two teachers from the center only exacerbates the challenge. But while Dunton recognizes that the program’s future is uncertain, she is sure that the students will keep learning and planning.